In the second grade, I tried to draw out something for the first time. Remembering the episode of Full House where Becky tells Jesse that she's pregnant (this clip, start at 1:41), I decided to announce to my parents that I was going to identify the 50 states by drawing it out (you may remember that I mentioned my first elementary school's focus on geography last week). I thought it would be easy, since "She's naming the 50 states" began the same as "She's having a baby." Well, I sat my parents down on the couch and drew the "cheese" for them. They didn't get it. Actually, they did figure out it was cheese, but they didn't get to the "she's" part. They made me stop, actually. I was quite upset that they weren't playing my game, but they did seem thrilled at my geographical ambition, so I moved on. 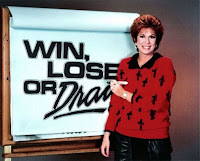 I caught Win, Lose or Draw a few times, and liked the "living room set," since it encouraged me to play it at home, and my grandmother bought me a Pictionary game that reminded me of the show. Brief history: The show didn't have a long run, just 1987 to 1990. But, over the course of those three seasons, nearly 600 episodes aired. 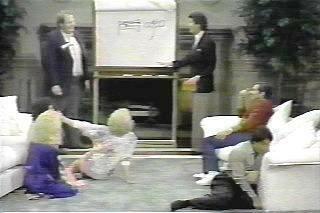 Burt Reynolds came up with idea ("charades on a sketchpad," essentially). There was a daytime version and a syndicated version, and the syndicated episodes have also run on USA (1990-1992) and GSM (2002-2004). The concept was based upon Pictionary - drawing a word or phrase, and others try to guess.The show did well enough that Milton Bradley came out with a couple versions for at-home play, and there were also DOS and Nintendo versions. The Disney Channel also did Teen Win, Lose or Draw in 1989. And, since it didn't run all that long, I'm thinking you might not have seen it, so I've included an episode below (which is called the "pilot" but I'm not 100% sure on that...). The game: There were two teams of three, one team of boys and another of girls. Two celebrities played with each contestant. You had a couple of markers and a large pad of paper to draw on, and one person drew a title, thing, or phrase, with the others guessing. You couldn't draw numbers, letters, or symbols, and you couldn't talk about what you are drawing. If one of your guessers got a word correct, you could write it down. In the first three rounds, you had a minute to win the puzzle, valued at $100. After 30 seconds, you had a chance to pass off to a teammate if you didn't think you could draw it, but the prize was only worth $50. Similarly, if you messed up and used a symbol or a number or a letter, the other team won half of the prize for that puzzle. If nobody guessed it when time ran out, the other team got one guess to steal the prize money. After the first three rounds, one drawer was nominated from each team to do the drawing in a 90-second speed round. You tried to do as many as you could, and could pass twice. Each correct guess was worth another $100. Whichever team had accrued more winnings at the end won another $1,000. If it was tied, both teams won $500 more. Notable changes to the way the game is played: In 1989, a change to the first three rounds... you had to wait 25 seconds to start guessing! You also couldn't hand off the marker, and the longer it took you to guess, the less the win was worth. An opponent steal was also devalued to $50. The speed round was cut to 60 seconds, each correct guess only being worth $50. AND, you got to move on to a bonus round at the very end. In the case of a tie, one team drew a single clue and the time counted up until it was guessed. The other team had that same counter tick down and if they guessed their word in time, they won. The bonus round was 90 seconds, trying to get as many correct as possible with each answer doubling the money won, from $50 on up. If you passed, you lost the bank. If you got seven right (regardless of passes) you won $5,000. You also stayed on the show until you won 10 games, or another team beat you. In syndication, the first round required the drawer to do a series of clues, and each had to be guessed, but they won $200. Special contestants: Well, being one of those shows that already has celebrities playing, it's difficult to figure out who "special contestants" would be. However, some of the celebrities who appeared include Burt Reynolds, Loni Anderson, Jason Bateman, Sally Struthers, and Richard Simmons. Favorite Rounds: Honestly, I can probably count the number of times I've seen this show on one hand. And, being a young kid, I didn't know many of the phrases or people that were being drawn. I also didn't really understand drawing multiple clues and then guessing a movie or person or whatever from those clues. But, I did like the excitement when the players had to draw fast and guess faster, so I'm going to say that the speed round was my favorite (though I suspect I probably liked the bonus round, judging from the years and such). My take: My favorite board game is Cranium. Within the game, there is a category of question where you need to draw out something for your teammates, and there's another where you have to draw it with your eyes closed. I'm a fair drawer (really depends on who is guessing), but I'm a great guesser. Ergo, I would have loved to be a contestant on Win, Lose or Draw. And I'd want Betty White on my team! As for the other celebrity, it's hard to say... I guess I'd hope that perhaps Jane Leeves was on the show? Or maybe Joanna Garcia, I think she'd be fun! oooh, or Alyson Hannigan, she strikes me as someone who would be on it. So, what about you? Did you ever watch Win, Lose, or Draw? Did you see it in the original run or in reruns later? Who would you hope to have as partners if the show was still on the air and you were competing?